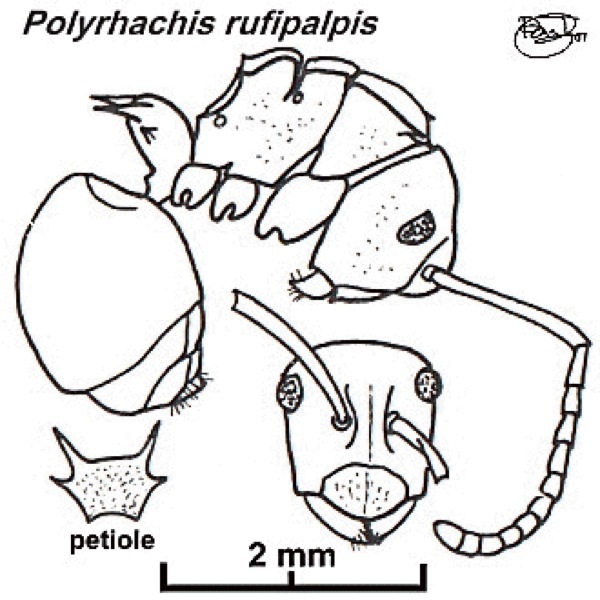 junior synonym mayumbensis (Polyrhachis rufipalpis Santschi r. mayumbensis n. stirps, Forel, 1913h: 358, worker) from Zaïre, collected at Mayumbe, by R. Mayné - see http://www.antweb.org/specimenImages.do?code=rmcaent000017824(see Bolton, 1995) . 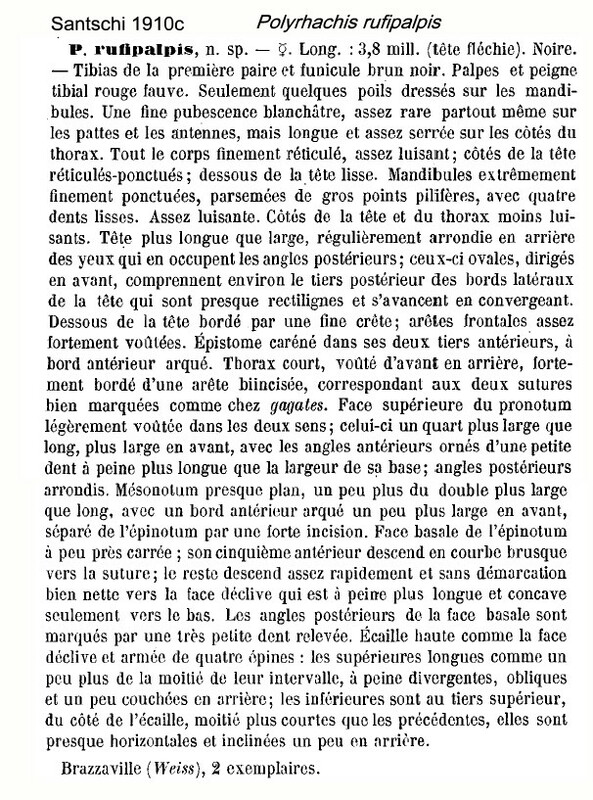 Santschi's (1910c) description is at . 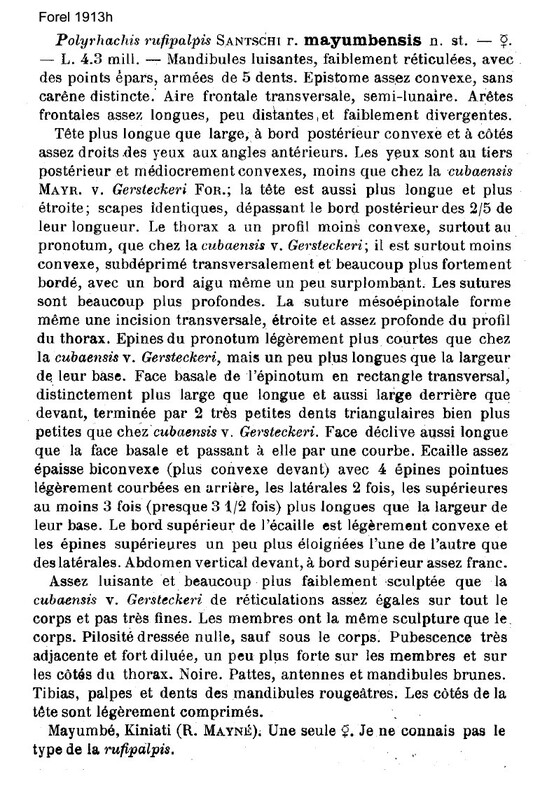 Forel's (1913h) description of mayumbensis is at . Bolton's modern description (1973b) is at . Sides of head forwards of the eyes more or less straight and parallel. Body devoid of erect hairs except on anterior clypeal margin and the gastral apex. Alitrunk marginate laterally, interrupted only at the sutures. Promesonotal suture incised, metanotal groove deeply impressed, with propodeum rising vertically from the groove, curving strongly and convexly into the posterior declivity. Petiole with moderately long dorsal and shorter lateral spines. Collected by me at the Cocoa Research Institute of Nigeria, Idi Ayunre, on low shrubs at the edge of cocoa, the first Nigerian record. 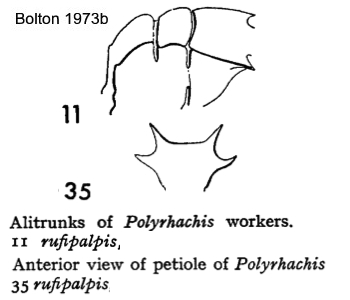 Arboreal, a small active species (Bolton, 1973b: 317, illustrated, alitrunk and petiole only). 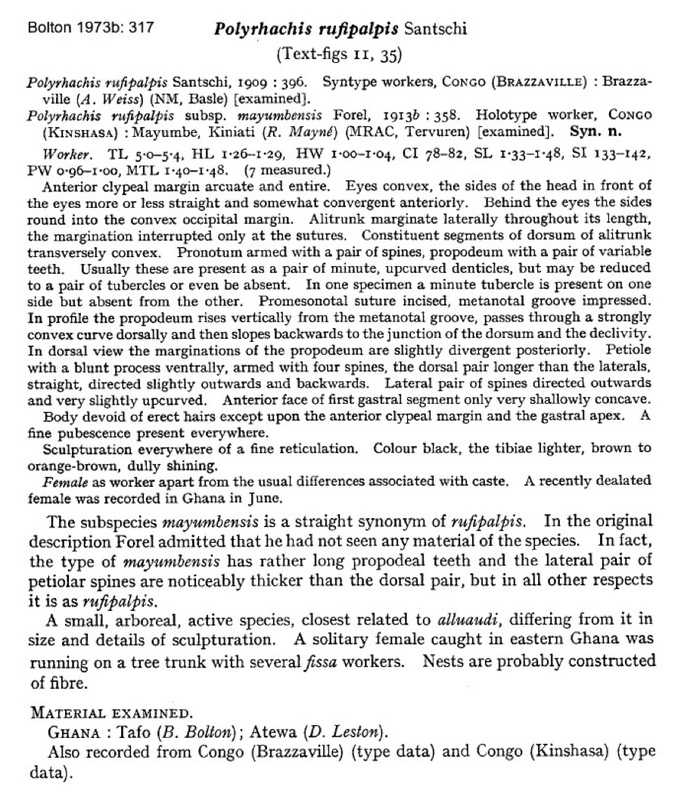 Found in Ghana at CRIG (B. Bolton) and Atewa (D. Leston) (Bolton, 1973b). Later by Belshaw & Bolton (1994b), who collected only two workers, as 'tourists' in leaf litter under primary forest, at Sui River Forest Reserve, and under logged primary forest at Atewa Forest Reserve. Rigato (2016) listed many additinal records from Central African Republic, Dzanga-Sangha & Dzanga-Ndoki; plus Uganda, Kibale NP, Kanyawara Biol. Stn., 0.56164°N 30.35655°E, 1500 m ± 200 m, 6–16.viii.2012, Ant Course 2012, field station clearing (G. Fischer) (1 w,HLMD). The photomontage is of a worker from Cameroun; Awae II; collector A Fotso Kuate (fk polyrhachis concava).